NOKIA MIGHT NOT be making phones any longer (for the time being anyway), but it’s moving into a whole new area. It announced the OZO, which it calls the first commercially available virtual reality (VR) camera designed and built for professionals. The camera captures stereoscopic 3D video through eight shutter sensors and audio through eight microphones. The software allows it to capture real-time 3D footage so a person can view the footage as it’s being recorded. Also, filmmakers can view a low-resolution version of the footage it shot within a few minutes if they or someone else wants to view it. The biggest problem with 360-degree videos is that footage usually has to be stitched together during processing before you can view them. Nokia is pitching OZO as a device that removes the need to do this, reducing the amount of time and work that’s usually required. Nokia says the OZO is the first in a “planned portfolio of digital media solutions” from the company, meaning there are more devices planned for the future. The price for OZO wasn’t revealed but it will be manufactured in its headquarters in Finland and will begin shipping in Q4 2015. 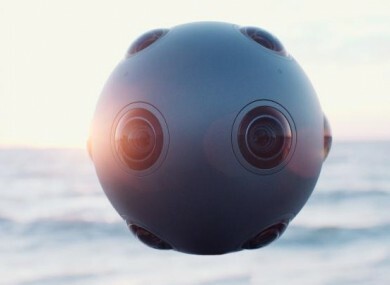 Email “Nokia isn't making phones, but it is making this weird-looking 360-degree camera”. Feedback on “Nokia isn't making phones, but it is making this weird-looking 360-degree camera”.